This painting depicts a group of scholars in a garden by a pond enjoying a banquet. 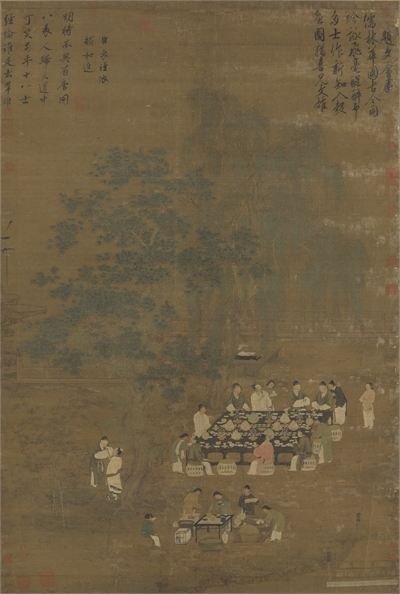 A large lacquered table has been placed under a tree with all kinds of tableware and food on it. In the foreground is a group of young attendants around a small table preparing tea. The figures are all spirited and elegant with clear expressions, while the objects and garden motifs are painstakingly rendered, indicating most likely a fine work of Huizong's Painting Academy. Judging from the inscriptions by Huizong and his minister Cai Jing at the top of the painting, it may be surmised that the contents are related to the historical event of the Eighteen Scholars depicted in "Ascending to the Isles of Immortality" in the Tang dynasty (618-907). Although the painting is beautiful and exacting, it still has a scholarly air that fully represents the requirements of and results sought by Huizong for his Painting Academy. Both in terms of quality and research value, it is a rare and important work.